Best Quick Easy Food Recipes has stolen both content and images from my blog without permission and without any acknowledgement or track back to my blog. I've written to them to remove content, but there has been no response - so I thought I'd let my readers know. All the mushroom recipes links belong to my blog see here. Savoury Mushroom and Leek Pudding original here. Maybe one of your recipes appears here too. Other than shaming and naming them on blogosphere, please let me know what to do. 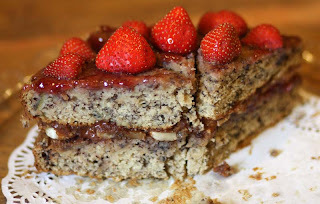 One of the cakes I created for the cafe is dubbed by my husband as The Graceland Cake aka Strawberry, Banana and Peanut Butter Cake. Its obviously a homage to Elvis Presley. Its proven to be very popular and hardly lasts a day as you can see as I was unable to take a picture of the cake while it was whole, as the slices just kept disappearing. Every one who has had a slice of this, has said its both healthy because of the fresh fruits and unhealthy because of the amount of fat in the form of peanut butter. Of course, its meant to be a treat, a little bit more luxurious - not to be consumed every day. 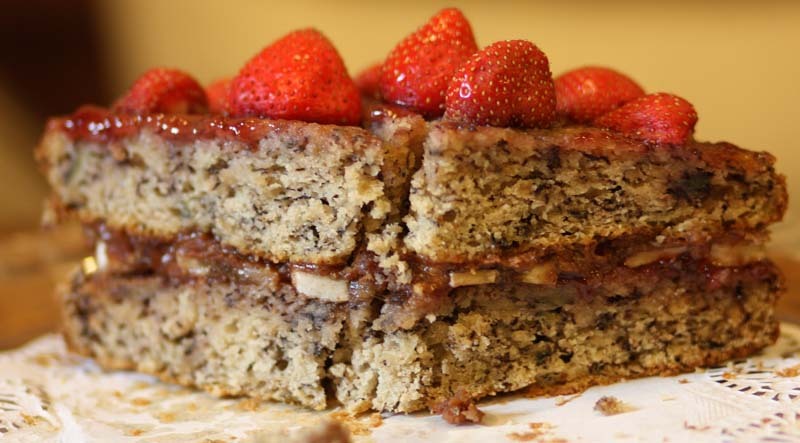 I've been told by a few customers that I should use the Graceland (Elvis) cake to promote the cafe, for example I should get someone to dress up as Elvis and offer some samples of the cakes on the High Street, this way I would also promote the cafeteria and encourage some people to walk up the hill and try out my food. I think its a very good idea. Anyone want to volunteer?! We also serve another Elvis creation at the cafe - The Elvis Bagel which I promise to share with you in the very near future. For now, just feast your eyes on this as the strawberry season says farewell until next year. For those of you interested in this recipe, its quite simple really. Its based on my Banana cake recipe. 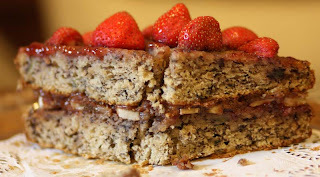 Instead here, I have split the batter between two 8 inch round baking pans; and then slathered one with smooth peanut butter; the other with homemade strawberry jam and then sandwiched them together with slices of fresh banana. For its final garnishing it is topped with more strawberry jam and fresh strawberries. Feel free to serve it with freshly whipped double cream if you want to dine more royally with the King. Thank you so much to every one who took the time to leave a comment on my previous post and for your warm thoughts and congratulations on my New Covent Garden Soup recipe being sold U.k wide. Every comment was truly appreciated. I recently read on my lovely blogger friends blog - Poppycock and other creative nonsense that October is orange - so true, the pumpkins and toffee apples are beginning to appear and peoples outfits are changing from the light stuff to the cosy hats, gloves and scarves. Yes everyone wants to be warm on the outside and inside. I like autumn. Its my favourite season, when I lived in Glasgow I would often enjoy strolling through the Botanical Garden kicking the dry golden leaves up high with my boots and feeding the gutsy squirrels with peanuts. 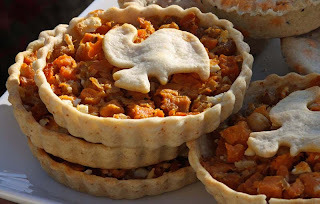 It is for this reason I decided to garnish some of my Butternut Squash and Feta tartlets with little squirrel pastry shapes. These individual tartlets are both sweet and savoury. 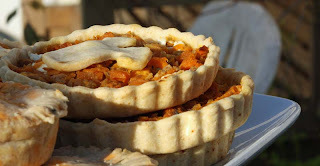 Sweetness from the butternut squash and savoury from the feta cheese. To some of the tartlets I also added some cooked black turtle beans for texture. I liked it, but it is optional. 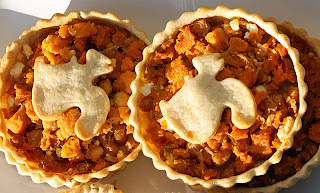 These tartlets are a variation of my Butternut Squash and Feta Pastry. See here. Well after a bit of a sleep in, I am off to enjoy the rest of my Sunday which means doing some laundry and housework. Hope to do some catch up on blog reading later tonight and respond to questions on my previous post. Enjoy your Sunday. I am also sending this tart to Ren's Simple and in Season event, that is being hosted by Kate of Feeding Boys and a Firefighter.